Metabolic testing will tell us where to start. Blood Glucose will show us any obstacles and Ultrasound technology will monitor results. Beyond the gadgets, a good old-fashioned conversation will allow us to customize your program to fit your preferences, lifestyle and personal obligations. Joanne does not hang her hat on any one diet. Every diet is custom diet, written from scratch and based on your goals, your preferences, your life, and your obligations. There are 16 recognized personality types so to think that one diet will work for everybody is unrealistic and sets most people up to fail. Purchase the initial consultation (we work with a lot of our clients remotely, we will work with your time zone). We will send you a questionnaire to fill out prior to your appointment. The appointment will take approximately 90 minutes and this payment will give you 3 weeks of full support by email and text, during this time we can handle any questions that come up and can make adjustments as needed. Follow up appointments are 60 minutes and come with 2 weeks of full support by email and text. This 10-minute breath test tells us exactly how many calories your body needs per day at rest. By measuring the oxygen in your breath, we can calculate how much energy you are burning. This test is essential in knowing where to start. If a nutrition program is based on a caloric intake far below your metabolic rate, your body will eventually slow down, burn fewer calories, and eventually, lead to the weight rebound experienced by so many. A recent article was published about the winners of the TV show The Biggest Loser. Thirteen of the 14 winners had regained all their weight and more because the show compromised their metabolic rate and (I am assuming) did not educate the contestants on how to eat after the show ended. The body has an incredible ability to adjust to any environment we subject it to. If we eat too little for too long, it will become super-efficient to burn less energy. It has been especially interesting to work with chronic dieters who have reduced their metabolic rate by 40 percent. On the flip side, it’s always fascinating to work with the elderly who have increased their metabolic rate above that of a 30-year-old. Your metabolic rate is not fixed and can be improved upon at any age. Your metabolism can drop in the first month of some diets. You might lose weight at first, but it is guaranteed that the weight is coming back. This can all be avoided by knowing your resting metabolic rate and designing a nutrition program around it. 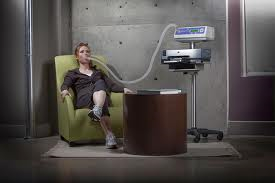 By re-testing, we can ensure that your metabolic rate does not drop (hopefully, it will increase). It would seem pretty ridiculous to start any nutrition program without knowing this information. 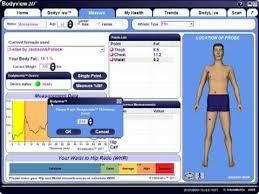 It is a 10-minute, seated breath test using Korr Laboratories ‘Metacheck’ technology. We advise re-testing every 4-6 weeks. The Shrink Shop puts so much emphasis on blood glucose testing that every client is given their own blood glucose meter. You cannot burn fat if there is too much sugar in your blood. We have had tremendous success by simply explaining how this works in our initial consultation. We are constantly told by clients that this information has changed their lives, and we are often asked why this is not taught in other programs. We are just as shocked! Knowing your blood glucose level is the single most important piece of the weight loss puzzle, but it is rarely mentioned unless people face diabetes. One drop of your blood (it’s painless; we promise!) will show us exactly what your body is burning for fuel at that moment. We track your test results to ensure that the nutrition program we build allows you to burn fat all day, every day. The accountability that our glucose test brings is outstanding. It is one of those “Ah-ha!” moments that can change the course of your life. That sounds quite grand, but please read our testimonials to see the response we have had! The initial consultation will explain why this test is so interesting and so important. 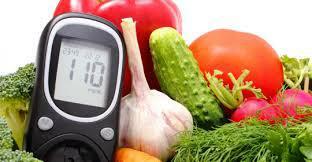 Clients become instantly engaged when they see how a meal impacts their blood sugar levels. Bottom line: You cannot burn fat if you have too much sugar in your blood. This test keeps it real and shows that eating healthfully may not be enough to reach your goals. Body weight is comprised of muscle, water (about 60-65% of total body weight), and fat. To know how much weight we want to lose or gain, we have to know how much we have of each. The issue is that people hold body fat in different ways, and some ways are easier to measure than others. Subcutaneous body fat is the fat that we can pinch. It sits right under the skin in rolls and is easy to measure with basic body fat tests, like body fat calipers. Imagine a piece of steak with the fat sitting in a layer on the top. Intra Muscular Triglycerides (IMTG) are not easy to measure. This is the fat that is marbled throughout the muscle. You cannot pinch it. Imagine that steak with the marbled fat you cannot trim off. Visceral fat forms around the organs and gives people that “turtle shell” midsection. This type of fat is strongly linked to heart disease, but it is thankfully fairly responsive to diet and exercise. 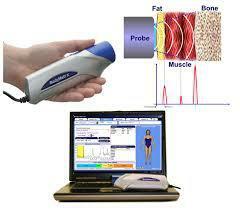 It is, however, difficult to measure with standard body fat test devices.